Aqua Notes. For $7, never lose track of a thought you had while in the shower. AquaNotes was exactly that product. 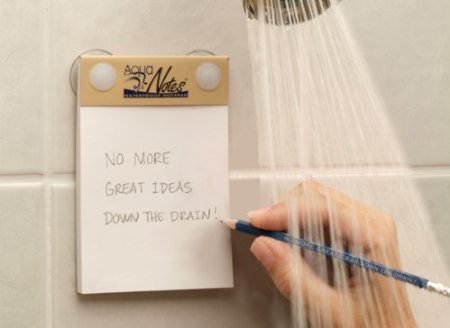 It’s a waterproof notepad that allows you to jot down ideas or reminders you have while in the shower. The notepad isn’t actually made of paper. It’s a white rubber/plastic material that you’d swear has the exact consistency of paper. It allows for writing on by pencil, pen, and basically any writing utensil. And it’ costs $7. $7 to never ever forget a thought you had in the shower. I bought a stack of them & I bought one for everyone in my family as a stocking stuffer. OMG, TAKE MY MONEY, AMAZON. This entry was posted on Saturday, April 13th, 2013 at 1:31 pm and is filed under Uncategorized. You can follow any responses to this entry through the RSS 2.0 feed. You can leave a response, or trackback from your own site.